So in pursuit of finding the limits of what can go into a Western Carolina Dip, I looked to no less of an authority than Mr. NC BBQ himself - Bob Garner. There will be a subsequent post on what I'm seeking in achieving in searching for parameters in the Lexington Dip. Here's Bob's recipe. As you can see, nothing too out of the ordinary except this oddball "Kitchen Bouquet" browing sauce. I've never used this ingredient before. From the packaging it seems like some kind of instant gravy mix. I happen to like instant gravy - don't judge me - so I figured it just be a savory counterpoint to a sauce that's essentially spicy catsup flavored vinegar. The worchestershire was actually a nice touch. The browning sauce does exactly what the name implies. It causes stuff to look brown which you can see on the photo below. A raw sample of it seems like it's aiming to add a vegetative quality, bland bordering on disgusting. 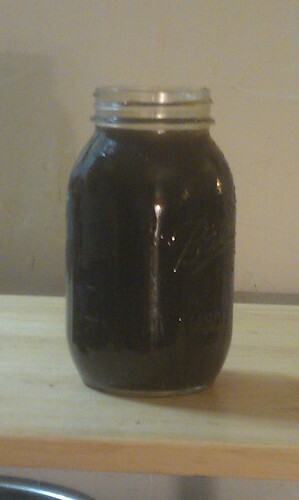 After cooking the sauce I let it cool and tooks a sip. 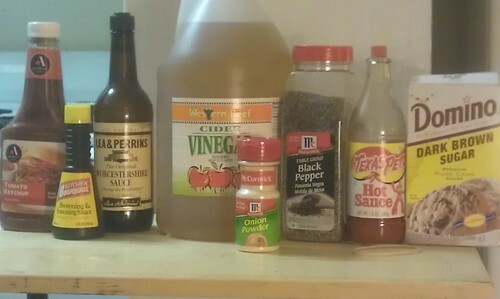 Now I'm no stranger to vinegar sauces, having made gallons of eastern carolina sauces before. But this one really kicked me hard. It was just in your face in a acidic sort of way. I'm letting the sauce sit in my fridge for the week and see how it looks with some meat. If it's still too strong I might dilute it with a bit of water and some mustard.